2016 - : Senior Data Scientist: Sotera / KeyW 2015 - : Affiliate Professor, George Mason U. 2015-2016: Senior Data Scientist, Defense Suicide Prevention Office (via NTVI Federal) 2008-2015: Research Assistant Professor at George Mason University. Areas: Judgment & Decision-making; Machine learning; Statistical inference; Philosophy of Science; Collective Intellligence; Computational Philosophy. Tonight’s release streamlines combo trades, adds some per-question rank feedback, prettifies resolutions, and disables recurring edits. 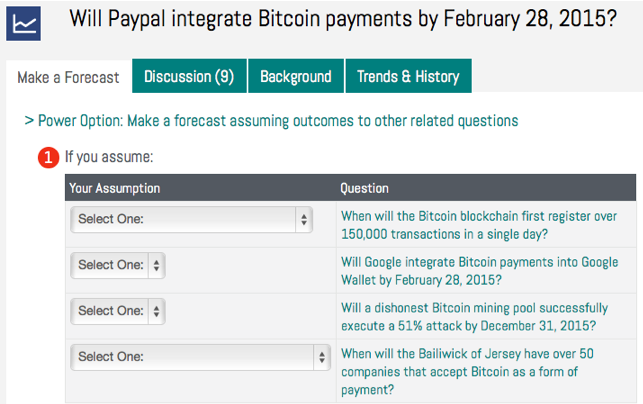 We’ve redone the approach to trading linked questions. Now if the question is linked to other questions, you can make any desired assumptions right from the main trade screen. Instead of estimating the chance of a particular outcome, you are asked to forecast the outcome in natural units like $. Forecasts moving the estimate towards the actual outcome will be rewarded. Those moving it away will be penalized. As with probability questions, moving toward the extremes is progressively more expensive: we have merely rescaled the usual 0%-100% range and customized the interface. Why did my forecast do that? I made a prediction just now of 10% and the new probability came down to 10%. That seems weird- that my one vote would count more than all past predictions? I assume it’s not related to the fact that I was the question author? The quick answer is that she used Power mode, which is our market interface, and that’s how markets work: your estimate becomes the new consensus. Sound crazy? Note that markets beat out most other methods for the past three years of live geopolitical forecasting on the IARPA ACE competition. For two years, we ran one of those markets, before we switched to Science & Technology. So how can this possibly work? Read on for (a) How it works, (b) Why you should start with Safe mode, (c) The scoring rule underneath, and (d) An actual example. A new SciCast ad campaign has created ~1,000 registrations per day for the past couple of days. That has doubled our forecaster community and created a lot of activity, which is great. But it also generated a lot of email notifications for users who had opted to receive updates for new comments, and more email is not always great. After a dozen or so complaints and a review of some comments, we have disabled email notifications until we add some more controls.